Gardiner offers a variety of lodging options. Whether you wish to stay in a hotel, bed and breakfast, rent a cabin or guest house to an adventure on a guest ranch or campground, Gardiner has it all. Explore this page to find where to stay in Gardiner. Headwaters of the Yellowstone. 9 Olson Lane, Gardiner, MT 59030. Cabin By The River. 1047 Highway 89 S, Gardiner, MT 59030. Phone: 406-848-848-7229. Headwaters of the Yellowstone Riverview Cabin. 9 Olson Lane, Gardiner, MT 59030. Gallatin National Forest - Gardiner District. 805 Scott Street, PO Box 5, Gardiner, MT 59030. Phone: 406-848-7375; Fax: 406-848-7485. Bear Creek Campground: Located 5 miles northeast of Gardiner in the West Absaroka Mountains. 1 dispersed campsite on a first come first served basis, no water, firewood or trash pick up. GPS: 45.11003; -110.59965. 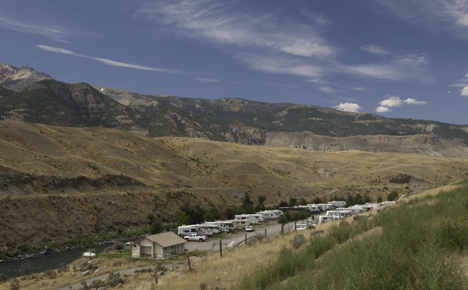 Canyon Campground: Located 16 miles north of Gardiner on Highway 89 along the Yellowstone River. 17 campsites on a first come first served basis, picnic tables, fire grates, toilet, no water, firewood or trash pick up. GPS: 45.18262; -110.88701. Chief Joseph Campground: Located 4 miles east of Cooke City on Highway 212. 6 campsites on a first come first served basis, picnic tables, fire grates, toilet, water, trash pick up and no firewood. GPS: 45.01959; -109.87376. Colter Campground: Located 2 miles east of Cooke City on Highway 212. 18 campsites, on a first come first served basis, picnic tables, fire grates, food boxes, tent pads, trash cans, toilets and water. GPS: 45.02814; 109.89441. Eagle Creek Campground: Located 2 miles northeast of Gardiner on Jardine Road along the Yellowstone River. 16 campsites on a first come first served basis, fire grates, no water, firewood or trash pickup. GPS: 45.04622; -110.67856. Soda Butte Campground: Located 1 mile east of Cooke City on Highway 212. 27 campsites on a first come first served basis, fire grates, picnic tables, food boxes, tent pads, toilets, trash cans, water, no trash pickup and no firewood. GPS: 45.02419; -109.91201. Timber Camp Campground: Located 5 miles northeast of Gardiner in the West Absaroka Mountains. 1 dispersed campsite on a first come first served basis, corral, no water, firewood or trash pick up. GPS: 45.09422; -110.60560. Tom Miner Campground: Located 17 miles northwest of Gardiner in the Gallatin Mountains. 16 sites plus 2 group sites on a first come first served basis, water, toilet, food boxes, corral, no firewood or trash pickup. GPS: 45.12938; -111.06253. Rocky Mountain RV Park and Lodging. 14 Jardine Road, Gardiner, MT 59030. Phone: 406-848-7251; Toll-free: 1-877-534-6931; Fax: 406-848-9112. E-mail GPS: 45.033364; - 110.705516. Yellowstone RV Park and Campground. 117 Highway 89 South, Gardiner, MT 59030. Phone: 406-848-7496. BEST WESTERN PLUS By Mammoth Hot Springs. 905 Scott Street W, Gardiner, MT 59030. Phone: 406-848-7311; Fax: 406-848-7120. Comfort Inn Yellowstone North. 107 Hellsroaring Street, Gardiner, MT 59030. Phone: 406-848-7536; Fax: 406-848-7062. Hillcrest Cottages. PO Box 430, 200 Scott Street, Gardiner, MT 59030. Phone: 406-848-7353; Toll-free: 1-800-970-7353. Riverside Cottages. Highway 89 & Second Street, Gardiner, MT 59030. Phone: 406-848-7719; Toll-free: 1-877-774-2836.